This is a fun game that will definitely say which ones are more epic, the vampires or the zombies. You will be playing on the zombie side and help turn all the zombies into zombies. 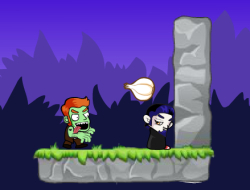 Have some fun throwing the garlic and detonating it in order to throw the zombies into the vampires so you will win each level. Try not to waste your shots and you will definitely get some laughs out of it. No vampire must be left untouched by a zombie at the end of the day. Use the mouse to aim and throw the garlic. Zombies vs Vampires 0.00 between 0 and 10 based on 0 votes.